One of my oldest friends from when I was a kid got married recently and I got to make their rings! 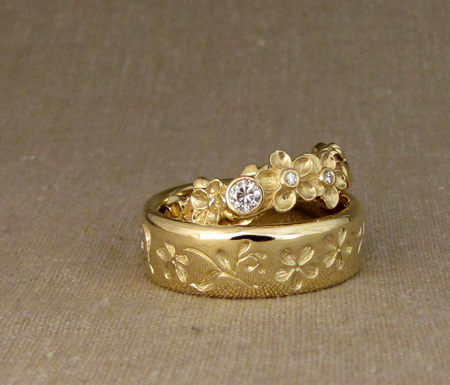 Forget-me-nots in 18K yellow gold with tiny 1.5mm stones in the flower centers and a single larger stone. 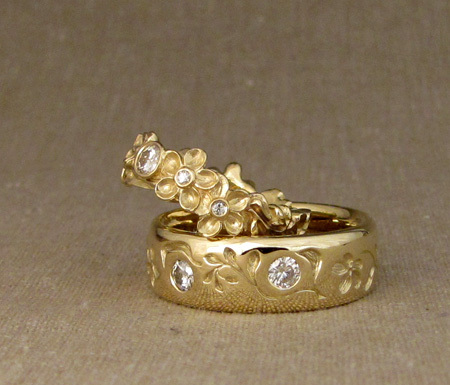 His band had a pared-down version of the design intaglio-carved onto a wider band + a couple of flush-set stones. I have no idea why I haven’t yet done forget-me-nots, because it makes for an awesome design motif. This entry was posted on Tuesday, June 23rd, 2015 at 10:53 am	and is filed under New work, Rings. You can follow any responses to this entry through the RSS 2.0 feed. You can leave a response, or trackback from your own site. 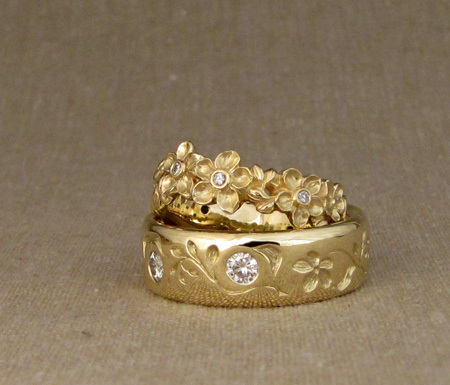 The forget-me-nots are splendid on these gold rings. It is a beautiful set for our friend from Oregon farm days, Melissa. I ran into your work on Etsy today. I knew you made jewelry but I had no idea how talented you are. I love your work. I’ll have to save and have you custom make a ring. So happy I got to see your work. We Weil’s sure are talented. Just wanted to tell you, nice work.